Cranbury, N.J. – Nov. 14, 2018 – Bluffton Self Help, a non-profit organization providing food, clothing and financial assistance to low-income residents of Bluffton, S.C., has gone high tech with an Iris IDÒ iris recognition system tracking the hours of paid staff and volunteers. An Iris ID iCAM R100 camera replaces mag stripe cards, said Tony O’Brien, president of Sourcecode LLC, a South Carolina-based software development firm. He designed the iris system, as well as a computer network and telephone system for Bluffton Self Help. 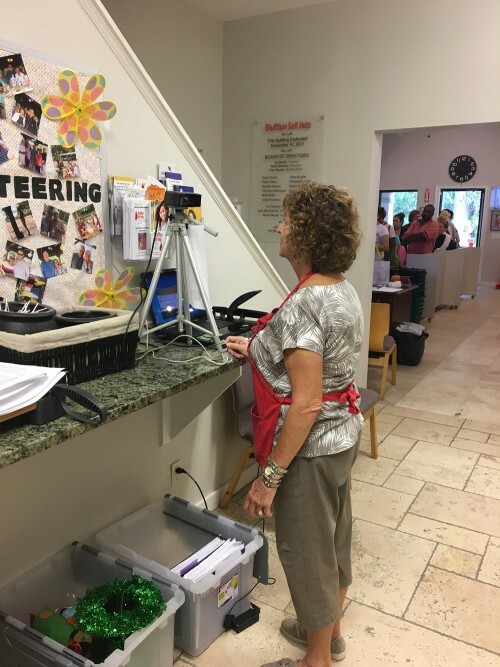 According to O’Brien, the iris-based system saved Bluffton Self Help from purchasing and printing new and replacement ID cards for the five paid staff members and more than 250 volunteers who regularly use the system. The Iris ID system paid for itself in about five months, O’Brien said. After staff inputs a new volunteer’s data, it takes seconds to enroll the person in the system. The person stands in front of a camera which takes a picture of both eyes (irises). Software turns the photo into a digital template stored on the organization’s computers network. The same camera is later used to identify volunteers arrive and leave in a process that takes less than two seconds. Kimberly Hall, executive director, Bluffton Self Help, said the volunteers, many of them senior citizens, tell her the system is easy and fun to use. Hall estimated volunteers annually provide about $1.2 million worth of services. That’s important to know when the privately funded group seeks contributions from donors who often want to make sure the organization has the manpower to ensure those in need are receiving services. Hall said patrons still use the swipe card system as many are undocumented residents and fearful of new technologies. She hopes education will change that as Iris ID’s stored digital templates cannot be reconstructed to identify a person. Mohammed Murad, vice president global sales and business development, Iris ID, said the Bluffton Self Help system shows how iris recognition technology is appropriate for virtually any organization needing identity verification for security or time and attendance.